On 27 June 2017, a representative of the World Sindhi Congress (WSC) presented its resolution to the UNPO General Assembly. Mr Gul Sanai raised awareness for the escalating human rights violations inflicted upon the Sndhi people, due to the ruthless implementation of the China-Pakistan Economic Corridor (CPEC). The UNPO General Assembly adopted the resolution calling upon Pakistan to undertake the necessary measures to ensure the economic, social, political and fundamental human rights of the Sindhi people are respected. Disturbed about the intensification in the enforced disappearances of Sindhi political activists by Pakistan’s security agencies. In last three months, scores of renowned political activists and writers have been abducted including Khadim Areejo, Hidayat Lohar, Bux Ali Mugheri, Raza Jarwar, Sabir Chandio, Hosho Qambrani, Aijaz Tunio, Insaf Dayo and Ayub Kandhro. At the same time, several Sindhi political activists abducted in the past remain missing including Suhail Raza Bhatti abducted two years ago and Mujeeb Cholyani abducted about a year ago. In all these cases the state denies any role and judicial recourse has also failed to provide any relief. These enforced disappearances are part of an ongoing operation by Pakistani state to create fear and harassment among political, human rights and civil society activists demanding democracy and human rights of Sindhi peoples. Many Sindhi political leaders receive regular threating messages that if they raise voice against CPEC, the occupation of Sindhi peoples’ lands and resources then they will face dire consequences. 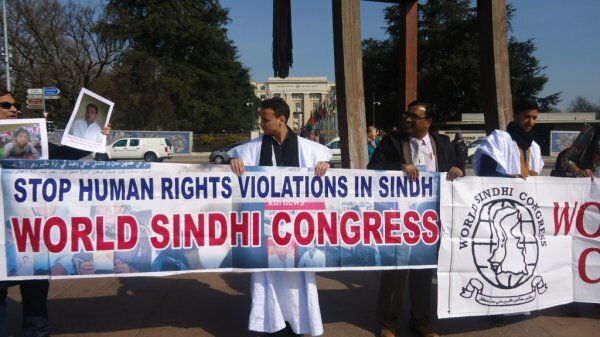 Many of the missing Sindhi human rights defenders abducted by Pakistani state agencies in previous years have been subjected to long periods of confinement in secret prisons, brutal torture or deaths. Troubled that Sindhi Hindus are facing increased violence including kidnappings for extortions, forced abductions, conversions of Hindu girls and forced servitude. This increasing violence has resulted in the exodus of the Sindhi Hindu population out of Sindh. In last few years, scores of cases were reported of Hindu girls, mostly age 16 and under, being forcibly abducted and converted, and in most instances were also forcibly married to unwanted men or kept in the custody of their kidnappers. Alarmed that there are estimated 20,000 new madrassas in Sindh, mostly funded by foreign money and under the patronage of the Government. The Islamic militancy is increasing, and Sindh has started seeing unprecedented violence against non-Muslim and non-Sunni sects of Muslims. The textbooks and school curriculum teaches intolerance and bigotry, further aggravating tensions between these groups. Several incidents of destruction and burning of the places of worships of Christians, Hindus, and Ahmadis have been reported. Concerned that although Sindh remains one of the most resource-rich states of Pakistan with one of the largest oil and gas reserves in the world. These resources contribute to 69% of all Pakistan revenue, and Sindh has the only seaport in the country. Sindh has 71% of the gas fields in Pakistan, 62% of the oil of Pakistan, and one of the largest coal deposits in the world (estimated to be $23 trillion – 99% of total coal reserve of Pakistan). In return, Sindh only gets 11% from federal government, and 75% of Sindhis live below the poverty line. Fifty percent (50%) of the population has diseases borne out of inadequate sanitation, lack of health facilities and proper infrastructure. The literacy rates among Sindhi women are 30%, and about 7 million Sindhi children under ten years old are out of school. More than 80% of Sindhis do not have access to drinkable water. Year after year, the Federal government appropriates these funds and get approval from the mainly Punjabi-dominated military, national assembly, and senate. There is no recourse in a judicial system that is subservient to the legislative assemblies. Further concerned that Sindh has been deprived of resources for development by the successive governments and the meager resources allocated for development are being embezzled with complete disregard of civilized norms of governance. Because of these factors human development in Sindh has touched rock bottom, economic activities are at a halt, unemployment among youth is spiraling, and poverty has reached alarming levels. Aware that Sindh is the home to more than 50 million Sindhi people. Sindhi society has been uniquely tolerant, universalistic and at the forefront of the struggle for democracy in Pakistan. Its rich culture and tradition provide a potent antidote to the increasing trend of religious bigotry, and militarism hat can be seen in the region today. The Pakistani State and its security agencies engage in systematic discrimination against Sindhis. Demands of the governments of Sindh and Pakistan to stop kidnapping, killing and attacking Sindhi nationalists, other political workers and activists; conduct a judicial inquiry into the incidents of extra-judicial killings; declare whereabouts of all the missing and illegally detained people and produce them in a court of law if they are accused. Asks the Government of Pakistan that perpetrators of the crimes against Sindhi Hindus and forced conversions, should be brought to justice and the safety and dignity of Sindhi Hindus and other religious minorities be ensured. Calls upon the current governments in Sindh and Pakistan to immediately address governance issues, and allocate substantial resources in development projects to generate employment and improve the quality of life of Sindhi people.. Demands that governments of Pakistan to stop appropriating the natural resources of Sindh and put in place the policies of fair and equitable distribution of resources as well as the policies to stop the internal displacement of people primarily affecting the demographical majority status of Sindhis in in their own homeland. Requests that the International Community shall recognize and help to resolve the issue of the right of self-determination of Sindhi and all the constituent nations of Pakistan under the auspices of United Nations Organization. Call upon the Government of Pakistan to stop the systematic spread of religious extremism in Sindh and other parts of Pakistan. Urges the Government of China and Government of Pakistan to halt the CPEC project till all the environmental, economic and demographic concerns voiced by peoples of Sindh and peoples of Balochistan are addressed properly. To take a look at the Sindh resolution, please click here.